Your tax deductable donations benefit the Creative-Holistic healing arts programs provided to youth and families at Art Studio World programs found nationally and internationally in major cities impoverished communities. Opening night, September 9, at 8 pm, California filmmaker Penny Little will present her new film “9/11 Dust: A Healing Journey”. The film features US Congressman Jerrold Nadler, Daily News reporter Juan Gonzales, EPA whistleblower Cate Jenkins, Susanne Mattei, numerous doctors and 9/11 first responders including John Feal of the Feal Good Foundation. Pause || Press Play is curated by L-M-N-T.com Gallery Miami, the art exhibition will feature artists Gino Tozzi, Ashley Cumberland, Billie Grace Lynn, Rachel Hughes, and Kevin Vancio. 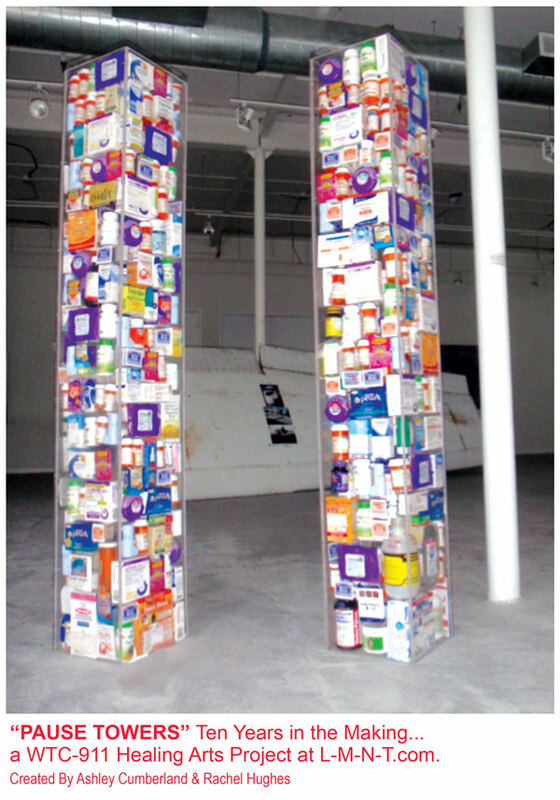 A centerpiece of this exhibit is “The Pause Towers” – a plexiglass sculpture filled with medical packaging from ten years of prescription based treatments of a health survivor of the World Trade Center illness. The schedule for the three day event includes films, presentations and guest speakers who are experts in the fields of holistic health, healing, creativity, integrative arts and education. Notable guest presenters include Dr. Lee Vickers, AmaLia Wai Ching, Olga Meylakh, Jonathan Talat Philips and many others. A press conference will be held Tuesday, September 11, at 1 pm at the Kraft Center, 606 W. 115th Street. A candlelight vigil is planned for September 11 at 9:11 pm. This entry was posted in Uncategorized on September 2, 2012 by pausepressplay.